Looking for a way to have fresh, clean and filtered water on demand at home without paying through the teeth? Water filter faucets are a great solution to give you fresh drinking water at home quickly, easily, and importantly at a low cost. The main attraction of these water filters is their ease of use and cheap price tag. With a ‘snap-on’ installation that doesn’t require a plumber or a back-breaking amount of struggle, you’ll find this product as a really quick, simple fix to your water quality problems. The faucets are also not a permanent feature in your home as you can easily remove them later on, or use them to get great water in even the smallest of kitchens. Although they generally have small capacities compared to more traditional water filters. You can easily switch the filter system on or off. This lets you save the filtering only for drinking water, not having to worry about wasting it all on washing or cleaning. If you’re just looking for our number one recommendation, then we’re fortunate enough to have an easy job for these products. After our research, we’re confident that the DuPont WFFM100XCH is worth every penny. Priced at the same level as the competition, it’s just got that extra level of quality that other models seem to be missing. The fantastic build quality ensures a long working life, the filter works as efficiently as we could ask for, and it looks great – all for a very competitive price. And if you’re not fully confident, DuPont’s three-year warranty should go a good way to reinforce your confidence. All in all, this faucet filter gets 10 out of 10 in every category we outlined as important before beginning our research. We’ve got no hesitations ranking it as our number one recommendation. Check it out on Amazon here. 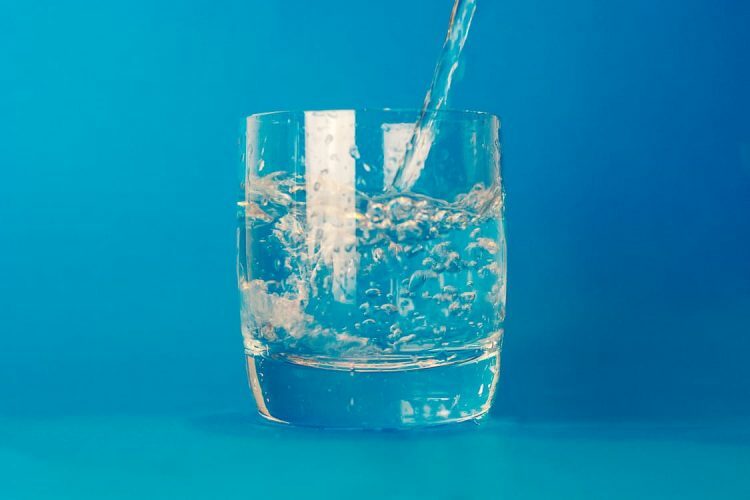 Filter quality – A no-brainer, these filters have to prove their worth in water quality – as well as the other factors below. Ease of use – We never want to recommend a product that you’ll have to spend hours sweating and cursing to install and use. The filter had to be simple to install, and a cinch to switch on and off. Build quality – One unfortunate drawback of these type of features, which come with the cheap price tag, is a lack of build quality. There’s little point stocking up on refillable cartridges if the seams of the faucet are going to start leaking water within a few months. Price – The all-important price tag. If a product is going to ask a lot of your wallet, we want to make sure it’s worth every penny first. The top dog for us. Reliable, efficient, and long lasting. 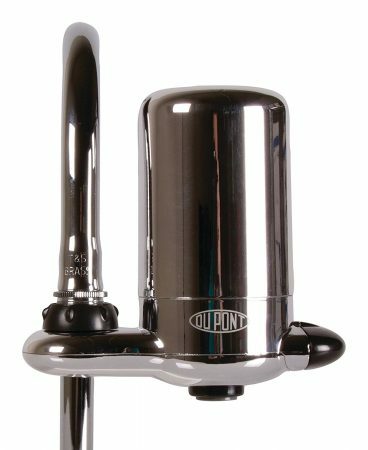 This DuPont water filter faucet makes us happy. Not only because it’s a fantastic product, but because this is one of those occasions where we can be of real use to you as a reader. 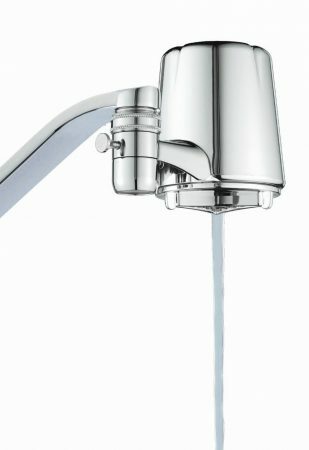 While it’s not #1 on Amazon or particularly well known, we believe that this is hands down one of the best water filter faucets on the market. Here’s why. First, it works fantastically well. The water tastes great, it’s easy to install and use, and simple to refill. Second, it’s got great build quality. The seams of the filter are all really well put together, which means that this filter will last much longer than the competition. One of the main problems with these types of filters is leaking or even spurting water out of their cracks after a few months of use. Not the case with this DuPont. Finally, considering all the above, it still boasts one of the lowest price tags on the market. It’s the ideal package. Great quality, great functionality, great price, and great looks. A fantastic product all-around – with a whopping 3-year warranty just to put the icing on the cake. Quality all-round: build quality, looks, functionality, ease of use For the first time ever - we can't find any drawbacks with a product. The full package at a great price. There’s not much more to be said than that. It ticks every box we were looking for in our research (material quality, ease of use, reliability, looks), without even coming close to a big price tag. We think this is an absolute steal. The Aqua Elegante really lives up to its name – it looks fantastic, and would be right at home in any modern kitchen. It’s hard to deny a polished stainless steel finish like the one on this filter. Not heard of Aqua Elegante? You aren’t the only one. Aqua Elegante is a small family owned company operating out of Beaumont, Texas. Starting off by producing high-quality shower heads, they’ve now expanded into other markets just like this one. So while they’re not a huge brand name company, they have a reputation for fantastic customer service and quality. Almost as if to prove that, they offer a no-questions-asked refund on this filter if you aren’t completely satisfied within the first four months. Anyway, enough about the company – let’s talk about the product. Aside from looking great, the filter’s big selling point is a fast, filtered flow. 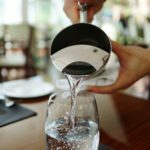 With most other filters, the output is significantly slower than a free flowing tap, leaving you waiting around to fill up your water glass. This model is known to have a substantially better flowrate, however, it does cause some to question the efficiency of the filtering system as a result. With that in mind, we’d recommend possibly going with a heavier duty model if you think your water needs a particularly large amount of filtering (but if you’re just looking to add that extra touch of purity and freshness, this model will do just fine). In terms of build quality and ease of use – we’ve got nothing but good things to say. 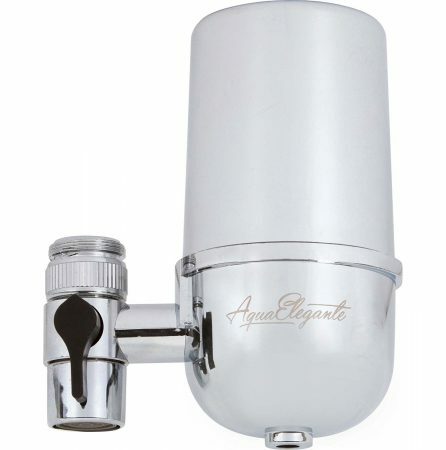 You can really feel the extra quality that Aqua Elegante are putting into their products, without losing the classic simplicity of a good water filter faucet. 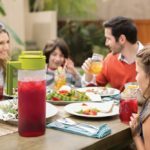 A great water filter, from a company that we’re growing to love. In a world full of big brand names, small companies like Aqua Elegante are a breath of fresh air – who are able to really focus on their customers. Their water filter looks as good as the name suggests while boasting a solid build quality and a fast flowing stream of filtered water. Their instant refund within 4 months is a big help to give you that extra boost of confidence in the product, too. We think it just falls slightly behind the DuPont in filtration and lifespan. Overall though, it’s a fantastic product that we thoroughly recommend. Culligan’s FM-25 water filter is a hugely popular model – with thousands of reviews, let alone purchases. It’s most loved aspect is a small size, which is an absolute luxury compared to some of the more ‘towering’ competition. Despite it being a subtle addition to your kitchen, it’s also an effective one. For such a small appliance, it’s rated as being a highly effective filter – especially with filtering lead in particular. The before and after comparison from a very happy customer below speaks for itself. The filter also has a great ‘auto-off’ switch to always reset the tap to your main water flow after each use. While switching on the filter every time may be annoying to some, we think it’s great for conserving the amount of filtered water you get out of each cartridge refill. The only complaint we do have is that when the filter is on, the water flow is quite significantly slowed down. You won’t be quickly filling up pitchers of water with this model (but once you do, the water will taste fantastically fresh). 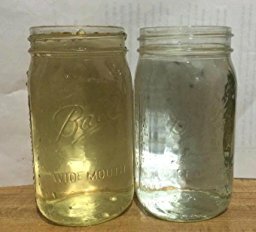 Before and after filtration comparison. A great product worthy of its popularity. It solves a common water faucet issue of being an eyesore, with a small and minimalistic design. The actual filtration works extremely well, even if it comes at the cost of a slightly slower flow rate. Priced to compete with the rest of the competition, we think Culligan have produced a great all rounder which ticks all of the boxes and is ideal for anyone who prioritises subtlety and effective filtration. Amazon’s best-seller, though we don’t completely agree. 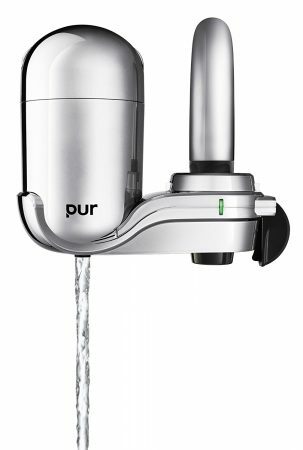 PUR’s 3-Stage Water Filter looks fantastic on paper. It’s Amazon’s top best seller. It’s thousands of reviews and a great average rating. The price is decent, and it looks fine. So why is it so far down our list? Because, frankly, the build quality isn’t as good as it looks. There are countless reports of the filter losing flow rate, starting to leak, and even spurting out water after only a few months of use. With any product, you’ll always get bad eggs that get reports like these, but there’s just too many to seem like it’s coincidence from this model. It’s disappointing, as PUR is considered a top brand in filters of all shapes and sizes. The other aspects of the filter are great – it looks good, initially functions well, and is easy to install. But it’s hard for us to justify recommending a product which is potentially on weeks away from breaking down and causing you problems. A filter with great potential, there’s just too many bad reports for us to fully recommend it to you. Otherwise, the product is great in terms of looks, simplicity, and price. But despite it being the most popular faucet sold on Amazon, we think that in this case – following the crowd just isn’t the right idea. Large and.. partially in charge. 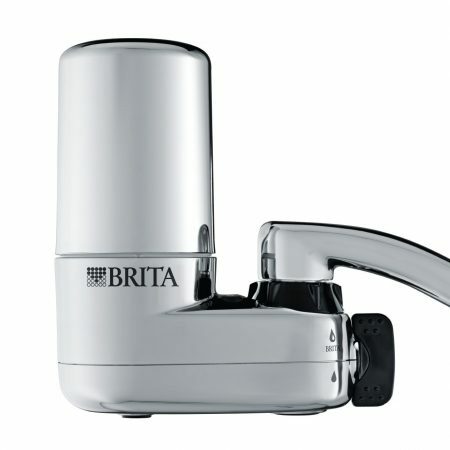 This Brita water filter is another vastly popular model – though without the same following as the PUR or Culligan faucets. Its standout feature is a small light indicator which lets you know once you need to start thinking about replacing the refillable cartridge. This can be really useful and an underrated feature, since realising this via a small light is much better than realising via a bad taste! Size aside, the faucet itself works great. The filter works well, with installation a cinch and refillable cartridges an easy task to replace. While this faucet ticks most of the boxes we were looking for, there are just other models that do the same job with fewer drawbacks. 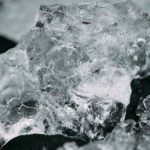 The large size and reported long-term issues, unfortunately, make the difference for us, on a product where the competition are all on such a similar level. It’s a solid product, don’t get us wrong, but we just think that the other models on this list – for the same price – are more worth your money. Sorry, Brita. We hope you’ve enjoyed our guide to the top water faucet filters. If any of our recommendations haven’t caught your eye – don’t worry. There are plenty other options out there, a great place to check these out is on Amazon’s bestseller list. If we have helped you find a faucet, then fantastic! Don’t forget to also grab a package of refill cartridges to keep you covered in the future.